Leopards are killed in South Africa and India in direct response to leopard-human conflicts, primarily leopard predation on livestock (with the occasional leopard attack on a human). Farmers in these areas are often at odds with wildlife as they struggle to make a living while losing large parts of their stock to predators (Butler, 2000). They feel the easiest way to solve the problem of human-wildlife conflict is to shoot leopards, regardless of whether or not they are livestock eaters. These farmers would not consider themselves poachers, but by killing leopards without a permit, in countries where these cats are protected by the Convention on International Trade in Endangered Species of Wild Fauna and Flora (CITES) and cannot be killed without one, they are, by definition, “poaching” leopards. Having interviewed farmers in a rural area of the Western Cape Province of South Africa two years ago, I have come across many who characterize leopards as “criminal” and “blood-thirsty” for daring to attack their property. Many also complain that “they were here first” and “never had problems with leopards before now.” These comments, and the retaliatory killings of leopards that sometimes follow them, are prime examples of how humans and wildlife are now frequently clashing over resources because of the rapid industrialization of biodiversity-rich countries and their exponential population growth, leaving little room for wild land and the large wildlife populations or complex ecosystems they support. In doing my dissertation research, I recently came across an article published in National Geographic by George Schaller that summed up the matter very artfully (Schaller, 2011, December). Schaller describes how, in the 1960s and 1970s, as a biologist, he did not think “the wilderness would so quickly become exhaustible” (p. 90). The focus then was on creating large protected areas where species could be conserved in large numbers. He argues that most countries now lack the wild space for such endeavors. Most reserves are small and cannot support large enough populations of big cats to insure that inbreeding, disease, or a random event will not wipe out these populations in one fell swoop. The focus now needs to be on creating “conservation landscapes” rather than protected areas: spaces where humans and leopards co-habit with minimal conflict while leopards travel in and out of reserves through wild corridors in human-dominated landscapes. Two main obstacles remain to the creation of such landscapes: the willingness of locals to protect their wildlife and the motivation of governments to invest resources in conservation. For governments to invest more resources, though, they need to feel the pressure of the public’s demand for wildlife conservation.This means educating the public, especially those who suffer from human-wildlife conflicts to accept the costs of co-habitating. Past research has shown that compensation schemes for livestock owners whose livestock have been killed by predators work in the short run, but ultimately fail because they are financially unsustainable and do not motivate farmers to protect their livestock more effectively. Better methods tend to be programs that reward locals for healthy predator populations in their communities, empowering them to practice better husbandry techniques and report poachers (Mishra, et. al., 2003). Fluctuations in rainfall resulting in lower prey availability in certain areas. The reality of limited conservation resources is that focusing efforts on the hardest hit areas is crucial. The results of my research will hopefully provide conservationists with some guiding principles of where human-leopard conflict is most likely to occur and trigger poaching. They can then apply their methods, including some situational crime prevention methods like reducing provocations (i.e. 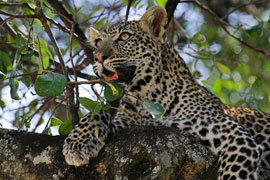 livestock predation), to prevent future leopard killings and rally community support for predator conservation. Julie Viollaz is a doctoral student at John Jay College of Criminal Justice and the CUNY Graduate Center. She is currently working on her dissertation focusing on cases of human-leopard conflict and retaliatory leopard killings in South Africa and India. She is also conducting a study of art theft in the United States from 2000-2008 to determine what artworks are most at risk and how to prevent their theft using situational crime prevention methods. In her free time, she is preparing for the inline speed skating national championships this summer and singing at the Juilliard School. This is the second in a three-part series on green criminology this month in recognition of Earth Day (April 22).